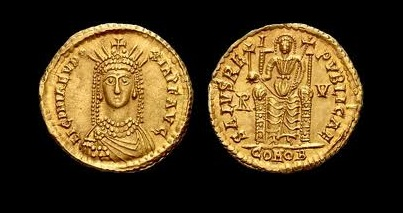 Licinia Eudoxia was the daughter of the Eastern Emperor Theodosius II born in 422 AD. Licinia married Valentinian III in 437 AD when she was only fifteen years old. She bore him two daughters, one of whom, Placidia, was later the wife of the Western Emperor Olybrius. Licinia was originally accorded the title of Augusta about 439 AD. In 455 AD, her husband was assassinated by the ambitious Petronius Maximus. Petronius, seeking to legitimize his position, forced Licinia to marry him. Thus Licinia married not merely her husband’s successor, but also his murderer. This outrage led her to contact Gaiseric, the Vandalking in North Africa, requesting him to attack Rome to avenge the murder of her late husband. Gaiseric was happy to oblige, and sacked Rome during the summer of 455 AD, carrying Licinia and her two daughters back to Carthage along with him. Some years later (462 AD), Licinia was allowed to return to Constantinople with her daughters, and spent the remainder of her years in the city of her birth. The coinage of this Empress is quite rare. It is only known stuck in gold in the single denomination of the solidus. No other denominations in any metal are known.